Make family fondue nights a new tradition! It is a fun and easy way to make lasting memories for everyone in the family! It's Friday Fondue Fun Day! You can not not have fun while dipping stuff in chocolate. If you don't have fun dipping stuff in chocolate there is something wrong with you. 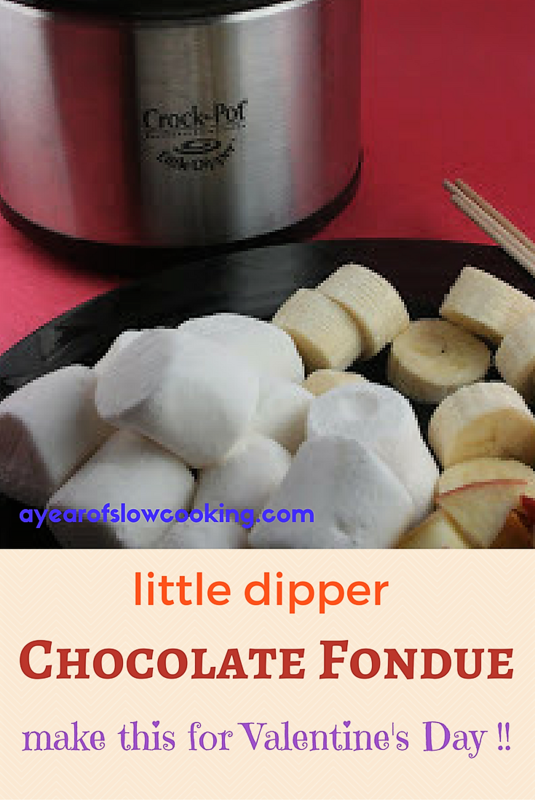 I needed a basic chocolate fondue recipe that was tried-and-true and perfect. This is perfect, and it's easy, and it's delicious, and if you plopped me into a vat of this I would swim around and really REALLY enjoy myself. The proportions here fit into a Little Dipper. Although the booklet that comes with the Little Dipper says that it only holds 1 cup of contents, I successfully proved this wrong with my earth-shattering discovery that a whole can of Progresso Clam Chowder fits perfectly. There's no need to create a water bath for melting chocolate in the crockpot. It melts nice and slow. Or! you can quintuple the recipe and have a good ol' time. Put chocolate chips in the crockpot. Add the heavy cream and teaspoon of vanilla. Plug in and cook on low (or the ON setting for the LD) for about an hour. Stir. Serve with apple chunks, banana slices, cubes of pound cake, strawberries, or marshmallows. Or all of them and invite me over. Simple and easy and wonderful and amazing. The kids liked the marshmallows the best, surprise, surprise. you have so much fun in your house! I would like to be your neighbor. I am sooooo gonna get me a little dipper! I love your recipes and you have inspired "CrockPot Tuesdays" at our house. Thanks! I guess if the contents being "dipped" are from different food groups, it could definitely be a "well-balanced" meal?! Sounds good to me!! I love this. I make my fondue in the micro (Heat the whipping creme, add chocolate and vanilla, blend until melted) and dip angel food cake in it. Yum. I might have to do it in the crock pot from now on! How can you go wrong with this? That's great! I'm not much of a chocolate lover but I'm thinking Caramel fondue wouldn't be half bad. I love reading your blog (I look forward to it everyday). You always make me laugh :). "Or! you can quintuple the recipe and have a good ol' time." That looks so yummy. What a fun way to spend time together! That looks fantastic - I love dipping foods in chocolate! 1 tablespoon of Amaretto or Framboise work well, too. 1 tablespoon of Amaretto or Framboise works well, too. Question: I'm not aware of there being 'heavy' cream around here, but the stores do carry whipping cream. Is it the same thing? Or would I get coffee cream? A friend of mine ran out of chocolate chips for her fondue, and tried aero chocolate bars instead. We had a lot of fun! The kids broke them up into pieces and had a great time watching them melt. I think they melted a little faster with all the bubbles inside them, but it tasted good, too! The smallest slow cooker I have is a 1.5 Q, so I think I'll go out and get a lilttle dipper, too! Thanks for the inspiration! It's always fun to read your blog! i would think that a little dipper would fit nicely on a desk at work. :-) Just think of that afternoon dipping snack!! I have long been concerned that you need more testers for these recipes. Surely your family needs time off now and then. Just found your blog and I'm so in love! Can't wait to try your recipes! After using Madagascar Bourbon Finest Vanilla, I can't go back to the "store brand" vanilla. Try it, you will be hooked. It makes cookies, cakes, fondue etc especially yummy! You rock by the way!! Just found your blog today and really love it! Now if you just had printable recipes! I'm going to have writers cramp! here is a basic chili recipe and here is a clean out the pantry version. highlight the text you like, then hit the print selection button on your print menu. BTW, The Kitchn was looking for crock ideas yesterday, and I mentioned your blog in my comment there, Steph. Not smart enough to link, but I expect folks can find it by name. hi steph. i feel pretty strongly about and only eat chocolate with at least a 70% cocoa content. would this work just as well? also, if im freaked out about the fat content of heavy cream are there any other decent substitutions for that? (other than not eating fondue, lol). Do you know if the chocolate sets up well after something is dipped in it? just curious if i could dip a bunch of apples and then just store in the fridge for when a craving arrives. thank you!!! p.s. i've been making quinoa in the crock a lot lately thanks to u and im so happy to have had ur guidance with that! You inspired me to go out and get a Little Dipper this afternoon! I'll be making the chocolate fondue for dessert tonight...thanks for the info! YUMMY!! I enjoyed a girls' night fondue with my 8 year old tonight. So simple... so delicious!!! I hereby pronounce that you can NEVA EVA EVA take this blog down from the www. My favorite fondue combo...white chocolate with amaretto. YUM. I totally love your blog!! I am going to get a little dipper, no doubt after looking at this fondue. :0) Can't wait to taste it! I love this blog!! Steph, you're my new hero!! I'm going to make this in couple weeks for a church woman's retreat for 25 women... any thoughts on how much I should make... other than A LOT!? We'll have other stuff as well, but this will clearly be the highlight! You have been tagged. I think your blog is great. I also think the crockpot sellers should give you a paycheck b/c you have made people use the crockpot again for more foods then they ever thought possible. In lieu of vanilla, I love to add orange extract to my chocolate fondue. :) Since orange is a bit stronger, you might want to cut the amount a bit, but it gives it this wonderful chocolate orange flavor--YUM! I made this for a baby shower today. It was a total hit and so easy! Hiya. If you are going to use real vanilla, save the rest of the pod and store it in a marmaladejar of sugar. then use the vanilla flavored sugar instead of the vanilla extract. We don't use vanilla extract here in Denmark much, but we do use vanilla sugar. Btw. I am hoping one of your readers can tell me an online store willing to ship one of these babies to Denmark. No crockpots or slowcookers on the market here. Got a 2 quart generic slowcooker, but would really like a programmable one. I may have missed this, as I am new to your blog, but what size family do your typical recipes accomadate? Or are they all different? Thanks! Made this tonight. I didn't have heavy cream, so I subbed evaporated milk. Turned out great. Thanks! Thank you! Made this last night for a 13th Birthday slumber party - quadrupled in a 4 qt Crockpot (using 4 bags of milk chocolate chips) and served with cut-up fruit (main course was hard/soft shell tacos). Last night, when cleaning up at midnight, the Crock was too hot to dump out the 1/4 fondue left so I left it to cool on the stove. Somewhere between midnight and 6:00 am, the ten teenagers sleeping over licked the pot clean with Mini Vanilla Wafer and Graham Crackers! Yum - I can get sugar-free chocolate chips at the Bulk Food store (diabetic) and use them. Hurray - fabulous with fruit. This will be my dessert next time I have company. Just made this for a 10 year old sleepover b-day party tonight! HUGE hit! Had a few crocks going with different flavors.....choc, white choc., PB & chocolate. Easier than baking & frosting a cake! Thanks so much!!!! This turned out AWESOME! I was a little nervous, making it for the first time for some ladies and gals from church but never fear, it was silky-smooth and delicious. THANK YOU!